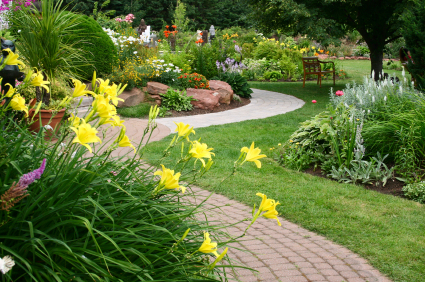 Our team of experts always finds a way to improve a landscape’s aesthetics and make it more functional. We have the expertise and equipment to take on all types of challenges, including slopes and tight access areas. 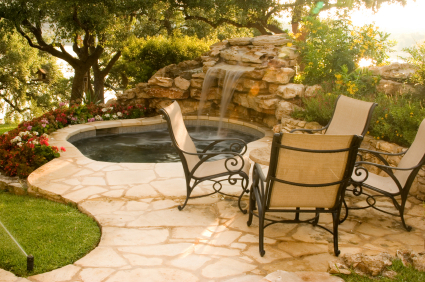 Ultimately, we strive to create outdoor environments that feel like personal sanctuaries. We serve San Francisco, Marin and the whole Bay Area since 1985! Fountains, ponds, creeks and waterfalls. 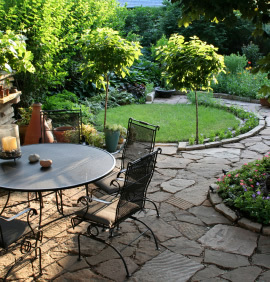 They can make a garden a sanctuary, and give an incredible return on investment. Arbors, fences, gates, gazebos, decks, retaining walls. We love a challenge. Plants make the garden. We take the guess work out, and complement your style and microclimate. From tropical to instant privacy screens and year around color. Enchanting low voltage lighting designed to entice and create the mood. Automatic sprinkles, drip & inline. You can go on vacation without having to worry. Always an essential first step in the construction process. Poor drainage can lead to a multitude of problems. Tight access is not a problem. We have the manpower and equipment to get the job done, and after working in San Francisco for over two decades we have seen it all. Essential for any thriving garden, we choose the most suitable for your garden type from sandy loam to organic. or at Better Business Bureau HERE. 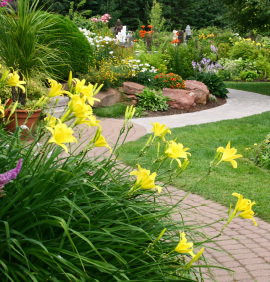 Atlas Landscapes provides customers with complete services starting with initial FREE consultation. Once we understand your wishes and taste we start creating concepts, or simple plans to three dimensional line structures for the client who is not visual, and full working drawings. We seldom consider a job too small. 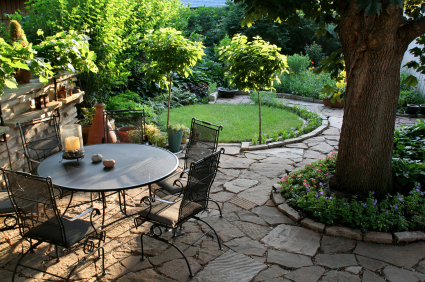 We can build entirely new gardens, or do creative renovations. We also work closely with Atlas Construction, a firm under the same ownership, to help you with possible structural problems in your house such as cracked, settled, or new foundation, or just installing french doors for direct acces to your new beautiful garden or deck. 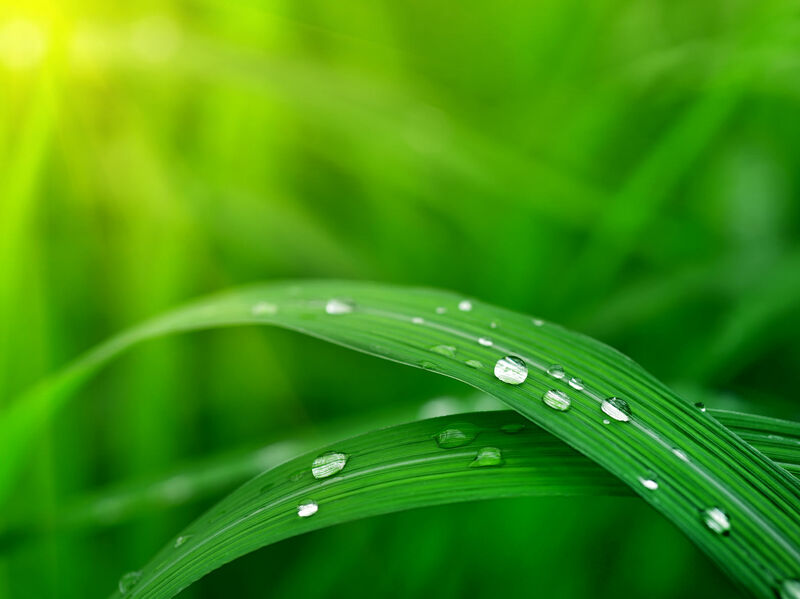 Once your garden is finished, we can also help you with maintenance. We work with the best. Dave and his crew did an amazing job on our backyard after it was damaged in a landslide. The end result was so much better than what we had before, it almost makes us glad that mother nature stepped in and gave us a blank slate. Dave stepped in and carried out the plans to perfection. Work was quick and efficient, communications were prompt and clear and prices were understandable and fair. And OMG the fountain they designed was beautiful. We just love hanging out in our new garden and get so much more use out of it than we ever did before! I cannot speak highly enough about Dave Graham and his company Altas Landscapes. 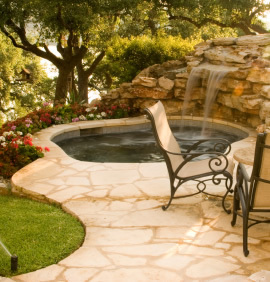 He does outstanding work including landscaping, Masonry/Concrete, Decks & Railing. We had an unfinished project in our backyard that was a mess. Dave came over, had great ideas, and his vision made us feel great about the project. His crew is outstanding, executed the project beyond our expectations, and in the time they estimated. They also cleaned up every day so that the project did not disrupt our daily lives. A cannot recommend them highly enough. Fantastic craftsmanship, incredibly organized, efficient and tidy work. Love the outcome, David was fantastic and a joy to work with. Dave and his crew did an overhaul of our hardscaping and landscaping 5 years ago. They did an outstanding job with their quality of workmanship and the integrity the crew. 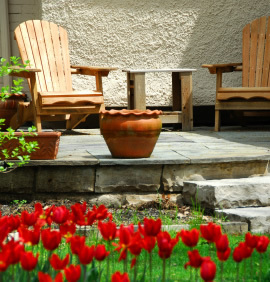 We still get compliments to this day of the impeccable stone work done on our walkways. I recently had a small stone slab come unhinged from the corner of the walkway. I called Dave 5 years later not knowing what the outcome would be? Dave listened to my concerns and sent his crew out immediately to repair it. That's a company who stands by their work! We worked with Dave and his team for the past two months to redo our back yard -- new patio, deck, stone walls, planting beds, irrigation, lawn, plantings, etc. It was a great experience. The space feels fantastic. The execution is top notch. Really high quality. The team is very hard-working: the crew was here every day at 8am, 6 days a week, and they had 8 or 9 guys working full speed at all times. They were also all very nice, considerate, and incredibly efficient. Dave is also super easy to work with. He has great experience, good insights and suggestions, and is incredibly responsive. Despite it dumping rain on us for most of the winter, they finished the quickly - faster than other contractors estimated they would take - and unlike some experiences I've had in my past with others, were very thorough and did not leave a list of incomplete items. We've been enjoying living in the space for a few weeks now, and I couldn't recommend them more highly. We just completed a major overhaul of our terraced garden in Bernal Heights after losing a beloved old cherry tree in a spring storm. 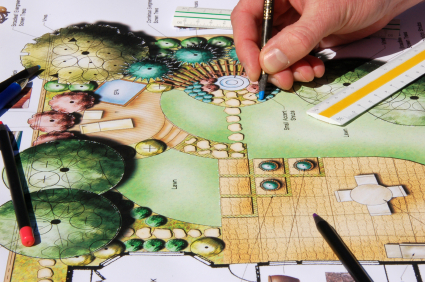 After interviewing several landscaping firms, we selected Dave Graham's Atlas Landscapes. Dave is an amazing listener, and truly understood our vision for the space, answered all of our questions, suggesting various approaches and bits of wisdom. The design entailed clearing out old plantings and two old stumps and root systems, some excavation with retaining walls, major carpentry work in constructing new, terraced garden beds, a latticed wall, a custom-built uniquely designed waterfall feature, a drip system and a lighting system. The new plantings included several trees, rosebushes, and an array of colorful plants. Dave submitted a bid proposal that was simple, but detailed with each line item of our "vision" having an attached budget. He was flexible however, in ways that some of the other firms we interviewed were not, such as making changes as we went, not requiring expensive drawings and letting us drive the process. Dave was also clear from the outset that we should expect a 10% contingency in the budget. When he told us he could have the job done in 7-9 days, I was extremely skeptical given the sheer volume of the work to be done. We had put in a deck five years ago, and what should have been a three week job turned into 9 weeks, so I've seen contractors go over time and budget before! But Dave's crew of 8 were truly phenomenal, and I don't use that word lightly! They were on time EVERY morning promptly at 8am, and were the hardest working team I have every encountered. Not a moment wasted, they worked full days and quite quickly we saw things coming together. They were polite, respectful of our home, and they even worked Saturdays. The job was complete (and I mean COMPLETE....not 95%, but 100%, exactly to our specifications) in ten days, with the highest craftsmanship, particularly the stone and masonry work. The custom stone-and-paver waterfall that they built is the envy of all of our neighbors, and is stunning. If I had any critique at all, it would be that the job did go slightly over the original budget + contingency. However, the overrun was not in any way his issue, it was due to the choices and changes we asked for along the way, and I wasn't really too concerned about small overruns. I didn't quibble at all on the final bill, as the work was exquisite and fairly priced. Overall one of the best home improvement experiences we have ever had. Highly recommended. We were trying to have the stone in our patio leveled because the person that installed it did it incorrectly and refused to return and correct it. 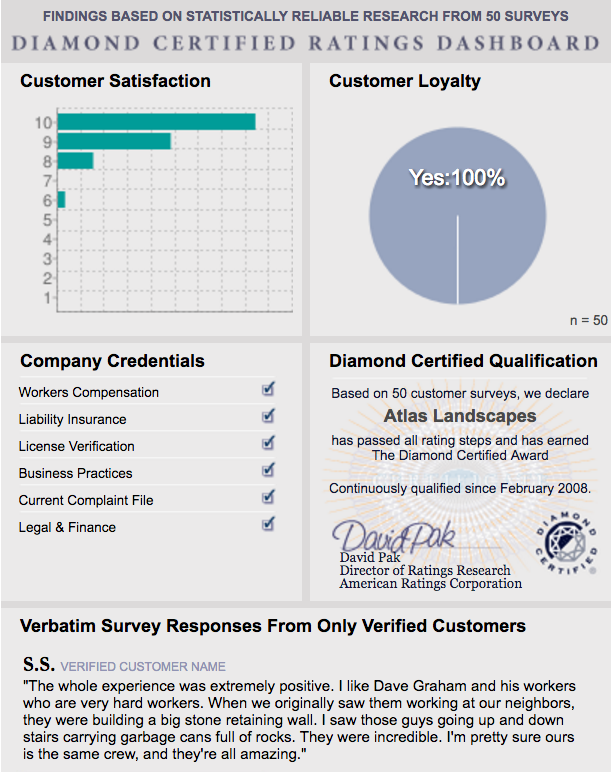 We looked at the Diamond Certified guide and found Atlas in it, so we thought we'd call them. We left message last Saturday, and we did get a call back on Monday. We were advised that they would be doing a job in our area, so they said that they'd call us by Wednesday to set up the estimate appointment. We followed up on Thursday and left a message. We called again today (Friday) and left another message. I guess this guy is too busy to call back. We worked with Dave Graham at Atlas Landscapes to do a long-anticipated job at our home in San Anselmo. 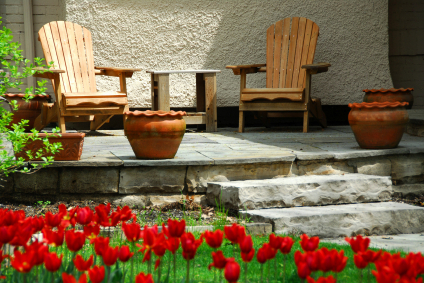 We did a lot of work in finding the right landscape company and when we visited jobs done by Atlas, we were convinced. The stone work was beyond amazing and every detail, including many that we hadn't thought of, was done so expertly and beautifully. His crew are respectful and professional and HARD WORKING. Our neighbors loved watching the progress and the finished job is so much nicer than we had anticipated, we kind of can't believe it's our house as it looks better than anything we could have imagined. I know this sounds too good to be true but Atlas truly is amazing.